February 7, 2017	/ 6:30 P.M. - 8:30 P.M. In recent decades Japan has changed from a strongly growing, economically successful country regarded as prime example of social equality and inclusion to a country with a stagnating economy, a shrinking population and a very high proportion of elderly people. New forms of inequality have been emerging and deepening, and a new perception of Japan as “gap society” (kakusa shakai) has become commonly acknowledged. The new forms of inequality are complex, and caused in different ways by a variety of factors. Their correction or remedy require fundamental reforms. The book provides a comprehensive overview of inequality in contemporary Japan. It examines inequality in labor and employment, welfare and family, education and social mobility, in the urban-rural divide, and with regard to immigration, ethnic minorities and gender. 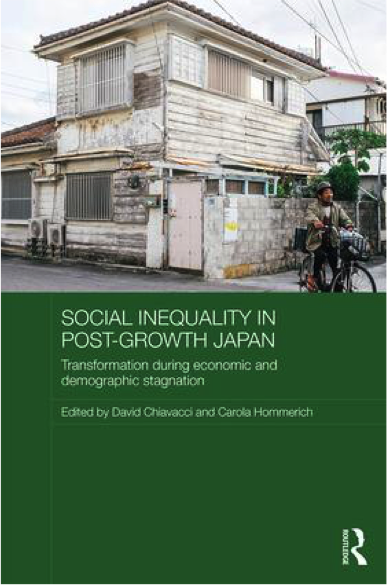 The book also considers the widespread anxieties associated with inequality and discusses to what extent the developments in Japan are representative of similar trends in other developed economies.